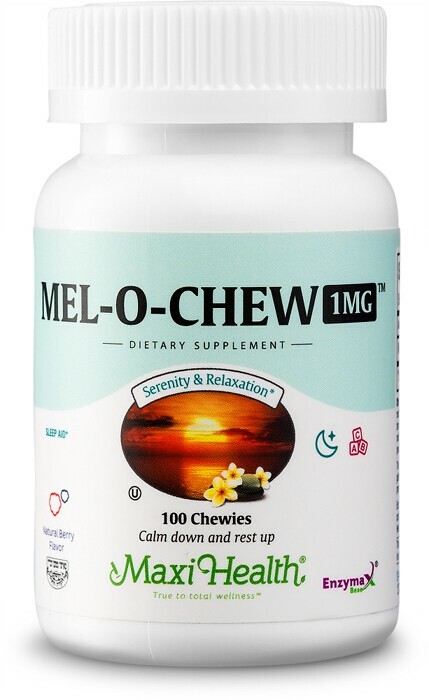 Mel-O Chew™ is a delicious berry flavored chewable tablet formulated with you and your family in mind. Melatonin is a natural hormone made by your body's pineal gland to make sleeping more inviting and to help with staying asleep. Sometimes due to advancing age or a shortage even with little children, supplemental melatonin can help restore healthy sleep patterns. It's great for jet lag too. Best of all, it is not addictive, just use as needed. 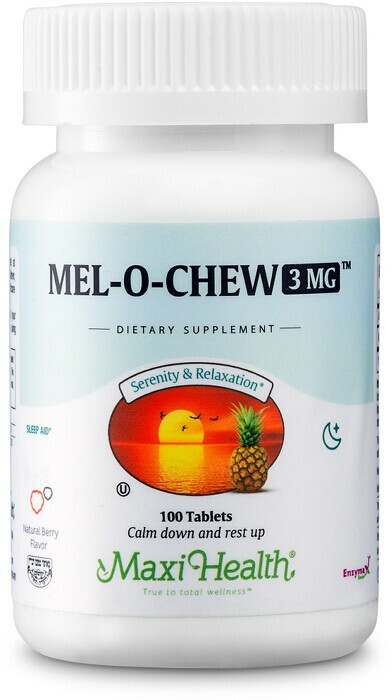 Mel-O Chew™ is now available in three popular strenghts, 1 mg, 3 mg and 5 mg. These chewable tablets can be split as needed so you won't waste anything. Make Maxi Health Mel-O chew part of your households night. Chew or swallow one (1) to five (5) tablets at bedtime, or as directed. Other Ingredients: Sorbitol, microcrystalline cellulose, modified cellulose gum, Enzymax® (calcium carbonate, bromelain, papain, lipase, amylase, protease, silica), maltodextrin, vegetable magnesium stearate, beet juice powder, natural berry flavor. This product contains no animal products, soy, wheat, gluten, yeast, sugar, salt, milk, artificial flavors, colorings or preservatives. My kids had a hard time falling asleep at night while in the morning had a hard time coming out of bed. This problem ended, when I discovered through a friend, a fantastic Maxi Health vitamin called Mel-O-Chew. I must say this works MIRACLES! About 10 minutes before sleeping time, I give them a dose of Mel-O-Chew and within a few minutes after they’re in bed they are fast asleep. I definitely recommend this vitamin to anyone with this problem. My success story is regarding the Mel-O-Chew sleep aid. I have one child who has an extremely difficult time falling asleep at night. Although he is young and his bedtime is at 9:00, he often cannot fall asleep until midnight (or beyond! ), even when he is tired. I have used Mel-O-Chew with great success. It helps him relax and allow himself to feel drowsy and fall asleep. Mel-O-Chew has made a real difference for my son. I had a lot of hardship trying to fall asleep. Everyone we asked including my doctor recommended Mel O Chew by Maxi Health before bed. Thank you so much for having a product that allows me to have the maximum amount of sleep each night! I have an energetic 2-1/2 year old daughter. Every night, I was hardly able to get her to fall asleep before 11:00 pm. I heard about Maxi Health Mel-O-Chew. It's a treat for her and is saving me from having to stay up late. Thank you so much! I was having trouble falling asleep. My mother gave one Mel O Chew and Chewable Calci-Yum before I go to sleep. I can sleep much better now. My son would constantly get out of bed because he could not fall asleep. I gave him a Mel-O Chew and to everyone's surprise, he was fast asleep in 15 minutes. Thank you Maxi-Health for this wonderful sleep aid. I took Mel-O-Chew and it helped me fall asleep. I am not tired during the day and function much better. Thank you. I have a very busy schedule through out the day, late at night I do some work outs at the gym which causes trouble falling asleep. 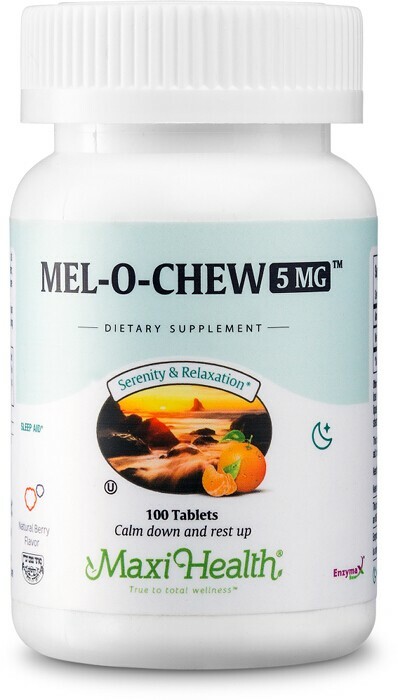 I tried the Mel O Chews, not only does it put me to sleep, it also puts me in a deep sleep for hours. Since I am a body builder it takes some times up to 5 Mel O Chews to help me fall asleep. You could feel the effect on the first tablet! Therefore I recommend this great product to everyone I meet, thanks to maxi health! I am very busy until late into the night. I go to bed after returning from working out at the gym. This makes it hard to fall asleep. I tried Mel-O Chews. Not only does it help me to fall asleep but I sleep deeply for hours. I found as a body builder that sometimes I require 5 chews to help me fall asleep but you can feel the effects from one of them. I recommend this great product to everyone I meet. Thank you Maxi Health. My brother had trouble falling asleep every single night. He was up for hours. With Maxi Health Mel-O-Chews the problem was resolved completely. He is now sleeping very well at night. Thank you very much. We would like to share our experience with Mel-O Chews. We have young children that complain to us that they cannot fall asleep at night and have trouble waking up. We have a solution by giving them Mel-O Chews and all they have to do after taking them is to relax in bed and they soon have sweet dreams. When we travel overseas The whole family takes Mel-O Chews for compensate for jet lag! My son is a difficult one and is on various medications for different reasons which we are slowly trying to replace with Maxi Health supplements. In the meantime we are using Max Relax and its really showing improvement for him.The Mel-O-Chew chew saves him from his sleep issues related to the medication. My son had a very difficult time falling asleep, every night. The pediatrician recommended that he take a melatonin supplement. After trying other brands we had success with Mel-O-Chew. Its been a tremendous change for the better for him. Thank you! Trying to fall asleep was a nightmare for me.. I use to lie in bed for over 2 hours or more. Some suggested that I try Mel-O-Chew. Now it takes me less than 20 minutes. Finally, I have a good night's sleep. Thank you. I was never able to fall asleep without a long delay. My mother said that there was a vitamin that would help so she bought me Mel-O-Chew. Since then I always fall asleep promptly. Thank you so much. I love it. For 4 years my little sister had the same problem. It took 2 hours for her to fall asleep.Since we gave her Mel-O-Chew she sleeps normally. Thanks to Maxi Health. Many times my mother has a hard time falling asleep. Now, all she has to do is pop two Mel-O-Chews in her mouth and she is out for the night. Getting my kids back to schedule after Yom Tov was always a struggle. Even before I started cooking, I feared the post Yom Tov schedule would be a disaster. My kids were tired and cranky throughout the day and hyper at bedtime. This would typically go on for weeks after. Maxi health came to the rescue. I gave each child a Mel-O-Chew nightly after Yom Tov and everyone was back to normal in 4 days. It was like a miracle. Thank you for helping us to create ever-lasting family memories.